Several factors, including the amount of arthritic damage to the knee joint, determine the best avenue for the treatment of chronic knee pain. Dr. Kastrup's extensive knowledge of joint pain allows him to guide patients through their available treatment options. Request an appointment with Dr. Kastrup. 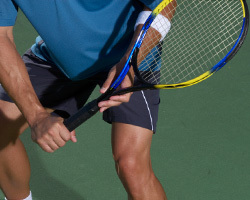 Knee damage can be caused by a range of issues – from general wear-and-tear to events of traumatic injury. Any of the resulting conditions can cause significant pain, as well as an inability to complete even basic everyday activities, such as walking or climbing stairs. Based on the severity of a knee injury, a patient may be recommended for surgical intervention, which may involve either a total or partial knee replacement. The specific procedure required can be determined through the diagnostic efforts of a trained orthopedic specialist. The knee is a complex structure composed by three primary bones, the kneecap, and menisci, as well as a series of ligaments. As a hinge joint, it is constructed to effectively bend and provide support during running, jumping, and other leg-based activities. Successful knee function requires effective interaction between its major components – medial (inside), lateral (outside), and patellofemoral (front). A healthy knee provides near friction-free motion; however, as damage is incurred, unnatural pressure and bone-on-bone movement can result in significant discomfort and immobility. During initial medical assessments, the orthopedic team will determine the extent and severity of joint damage present, especially whether it encompasses one or more of the three components. In cases of extensive knee damage, total knee replacement may be prescribed. However, if the osteoarthritis or like damage is confined to a single knee compartment, a partial knee replacement may be appropriate. In instances of this procedure, which is also called unicompartmental replacement, only the damaged area will be removed, leaving any healthy bone and cartilage in place. As with total knee replacement, the diseased section will be replaced with a metal and/or plastic prosthesis. In addition, due to the maintaining of as much healthy bone as possible, many patients have reported a "more natural" feeling and bending joint. While both an attentive at-home exercise and formal physical therapy regimen will be necessary for ongoing recovery, patients undergoing partial knee replacement will likely experience an expedited return to their everyday and recreational activities. While knee replacement efforts have advanced in recent years, there are still minimal risks associated with any procedure. Immediately following a partial knee replacement operation, patients should report any intensified pain or swelling, as well as fever or other symptoms, for immediate medical attention. Before surgery, the orthopedic team will outline all expectations as to recovery and rehabilitation, including associated timelines. Over the long-term, patients undergoing a unicompartmental replacement may become candidates for a more total procedure. This can result from the aging of the initial prosthesis, natural advancement of osteoarthritis, or occurrence of a post-procedure injury. Should any symptoms or disability reemerge, patients are encouraged to schedule an orthopedic consultation for more in-depth assessment and diagnosis. Dr. Kastrup and his team are experienced in the treatment of a range of knee conditions, including those requiring surgical intervention and repair. If suffering from knee pain, or seeking secondary diagnostic opinion, schedule an appointment with the Henderson, NV practice.